Happy birthday to Ray Bradbury (22 August, 1920 – 5 June, 2012)! "They began by controlling books of cartoons and then detective books and, of course, films, one way or another, one group or another, political bias, religious prejudice, union pressures; there was always a minority afraid of something, and a great majority afraid of the dark, afraid of the future, afraid of the past, afraid of the present, afraid of themselves and shadows of themselves." 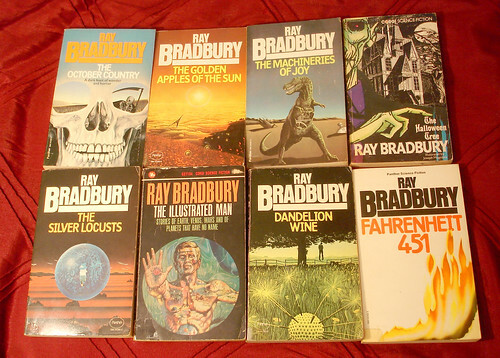 My mom turned me onto Ray Bradbury when I was about middle-school age. I've loved him ever since. May I join? Happy birthday to Ray Bradbury! He is one of my favourite writers. Please do! :) He's one of mine, as well. One of Bradbury's more interesting credits is that he had a major hand in the design of the Spaceship Earth attraction at Epcot Center, including having written the script. Then there's the issue of the theme behind Fahrenheit 451. Popular thought claims it's about censorship. Mr. Bradbury said it's about apathy towards books and them being tossed aside in favor of other media (particularly television). Personally, I'm inclined to go with the latter, and not just because of the author's preference. The censorship angle allows the reader to feel smug about how he would never bow down to such tyranny imposed from without. The latter forces the reader to consider the possibility that he is part of an ongoing problem. Very true! That's so cool. You're quite right about the theme. That's something we discuss in both my science fiction and dystopian courses. I love how Fahrenheit 451 and "Usher II" (my favorite short story of Bradbury's, and that's saying something) speak to each other thematically, as well.